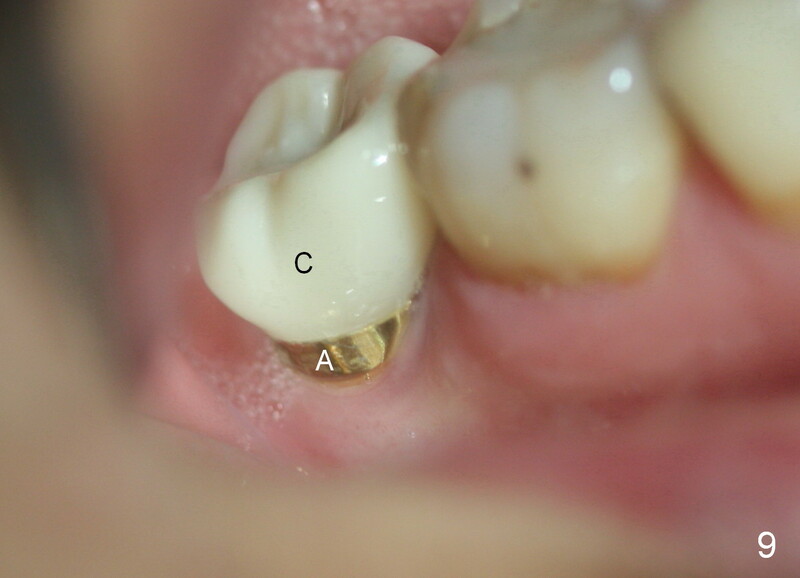 When the patient returns for extraction and immediate implant, the buccal gingival margin of the tooth #31 (Fig.1 ^) is lower than the lingual one. Purulent discharge is pushed out of the buccal gingival sulcus when anesthetic is being injected. 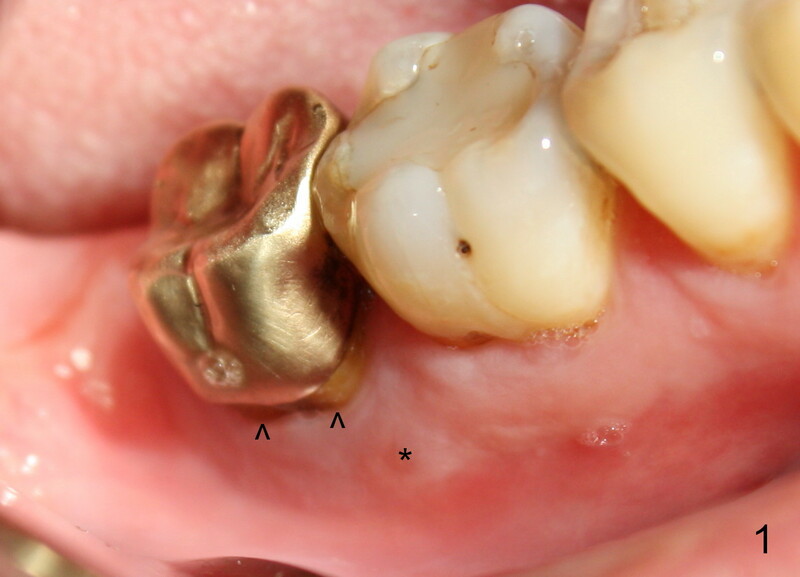 After extraction, the buccal plate is found to be lower than the lingual. Because of this and severe distal defect, the osteotomy is initiated in the mesiolingual socket. 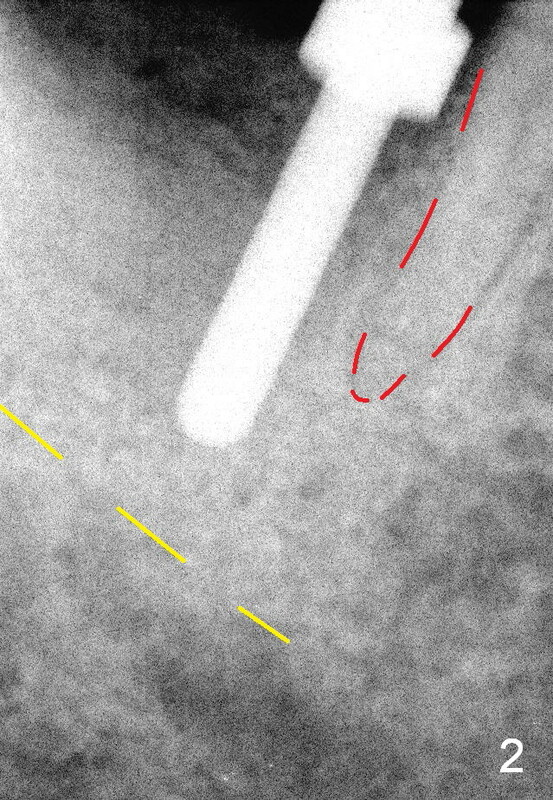 It appears to be overdone (Fig.2, close to the distal root of the 1st molar (red dashed line)). Then the osteotomy is moved distally. The osteotomy is enlarged with reamers 2.5-4.5 mm. A 5.9 mm tap is tried without binding to the bone, while 6.4 mm one has some degree of engagement to the osteotomy (Fig.3). 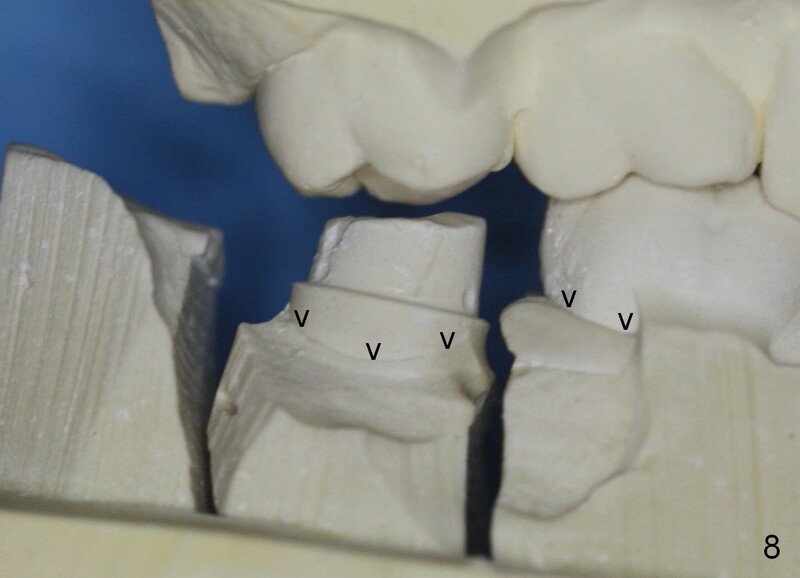 The last tap appears to deviate buccally; using 6.9 mm tap may encroach the buccal plate (causing it to resorb). 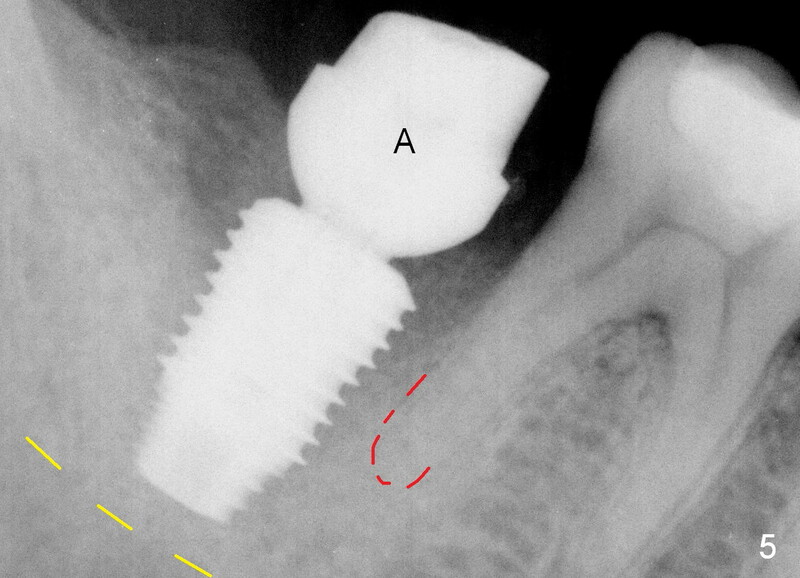 So a 6.4x10 mm implant is placed; the insertion torque is 25 Ncm (Fig.4). 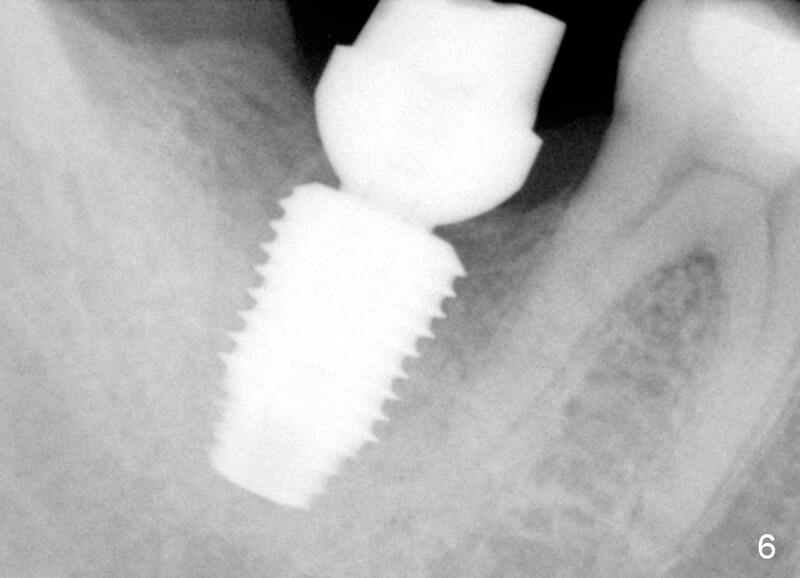 When trying cemented abutments, the implant is loosened. 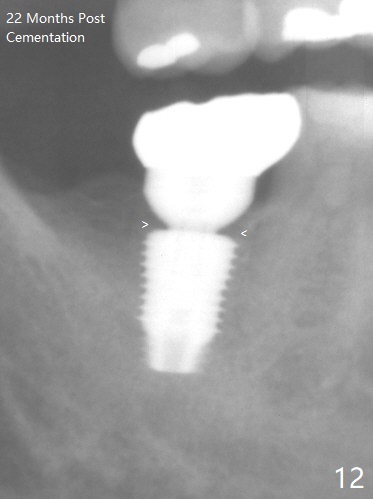 A larger implant is placed (6.9x10 mm Fig.5) with insertion torque 50/60 Ncm. 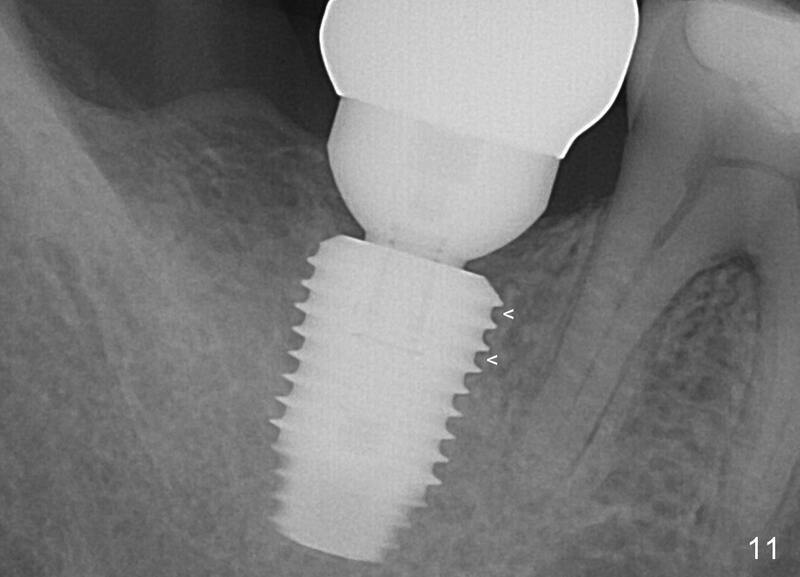 The implant appears to invade buccal space. The buccal plate appears to be thin. 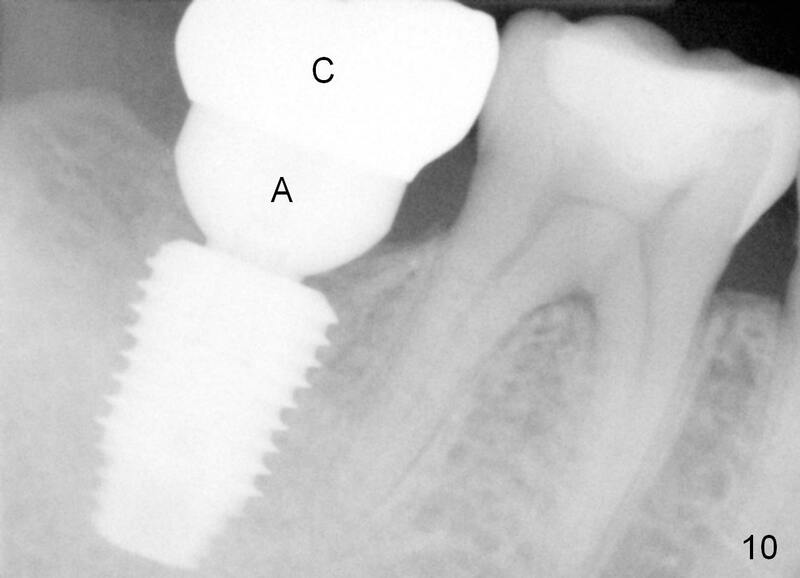 A 7.8x4(4.5) mm abutment (A) is placed immediately for immediate provisional fabrication. The harvested autogenous bone is mixed with Osteogen and placed in the distal remaining socket. Combination of the abutment and provisional keeps the bone graft in place. 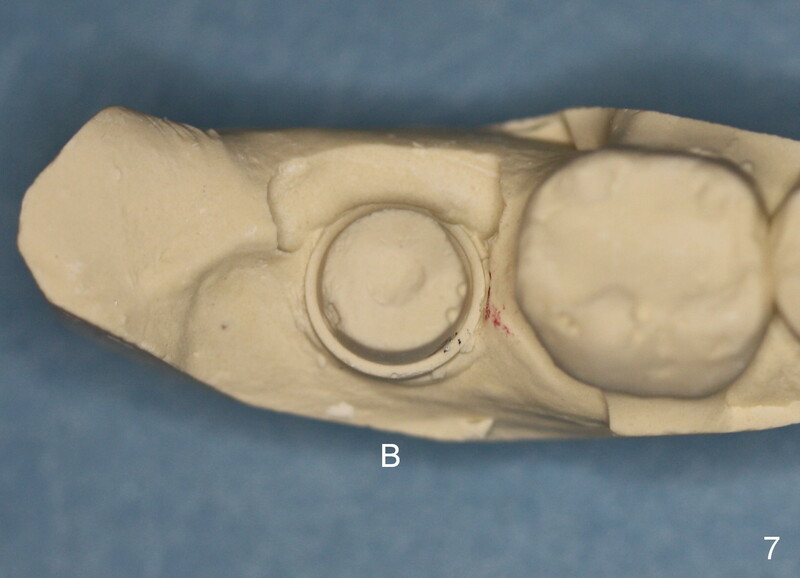 To place a 6.4x10 mm implant in the freshly extracted socket (Fig.4), the most apical portion of the implant (~3 mm) is engaged into the freshly prepared osteotomy, while the coronal portion of the implant may contact the lingual and buccal plates for primary stability. Before implant placement, it is nice to place a corresponding tap first to test that the former can engagement to the osteotomy. In the SM Extra wide Kit, there is only one tap (6.4x6 mm) which is not able to engage to the coronal buccal and lingual plates. When the implant is placed, it may be too tight (unable to be seated completely) or too loose. The company should produce 3 taps for each sized implant: 6.4x6, 6.4x8 and 6.4x10 mm. The patient returns for follow up 9 days postop "I chew on the left side 60% of time". Exam shows no gingival erythema or tenderness and apparently mild mobility of the provisional. The occlusion of the latter is reduced. He returns with dislodgement of the provisional 1 month postop "I have pain when I bite down hard". The implant appears unstable. The provisional is relined with no occlusal contact. The patient returns with provisional dislodgement 3 months postop. 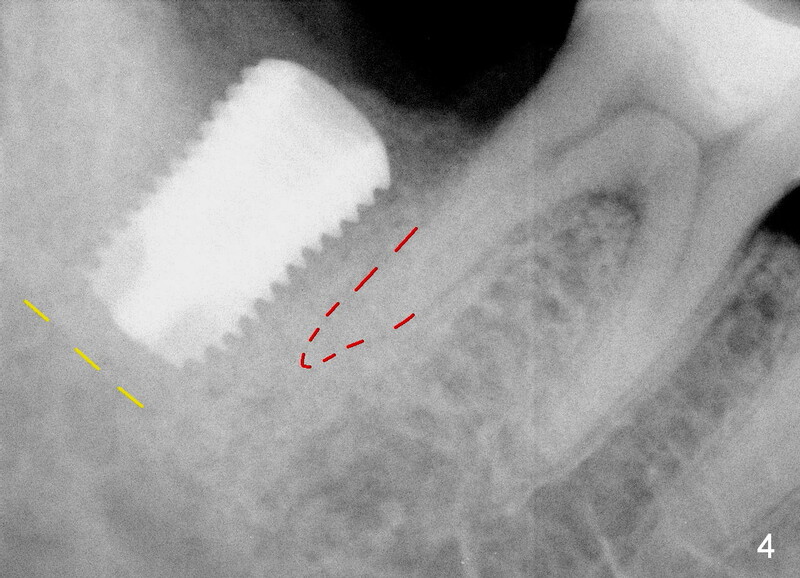 PA is taken without bone loss around the implant (Fig.6). To eliminate any occlusal contact, the provisional is not re-cemented, since the socket has completely healed. He is advised to return for restoration 1 month later. The final crown is delivered 7 months postop. 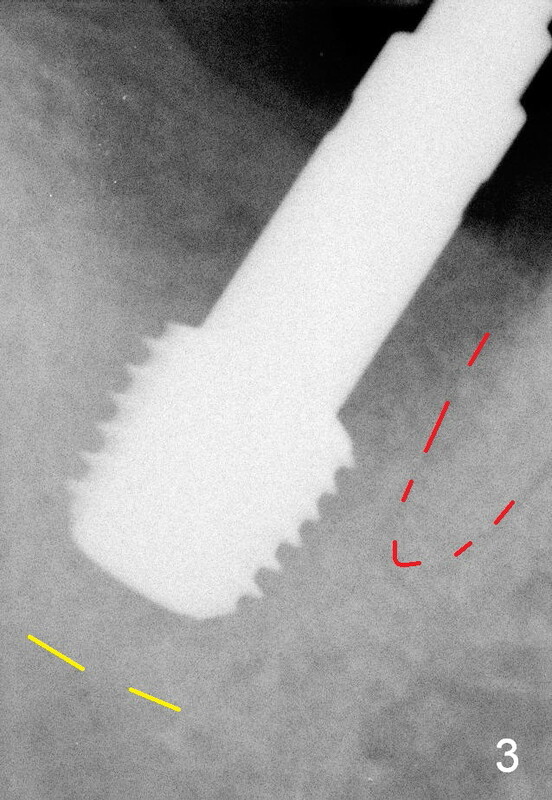 It appears that the implant is placed a little too buccally (Fig.7 B), in association with buccal gingival recession (Fig.8 (arrowheads), compare to Fig.1). The implant crown (C) functions normally 6 months post cementation without further gingival recession (Fig.9) or bone resorption (Fig.10). 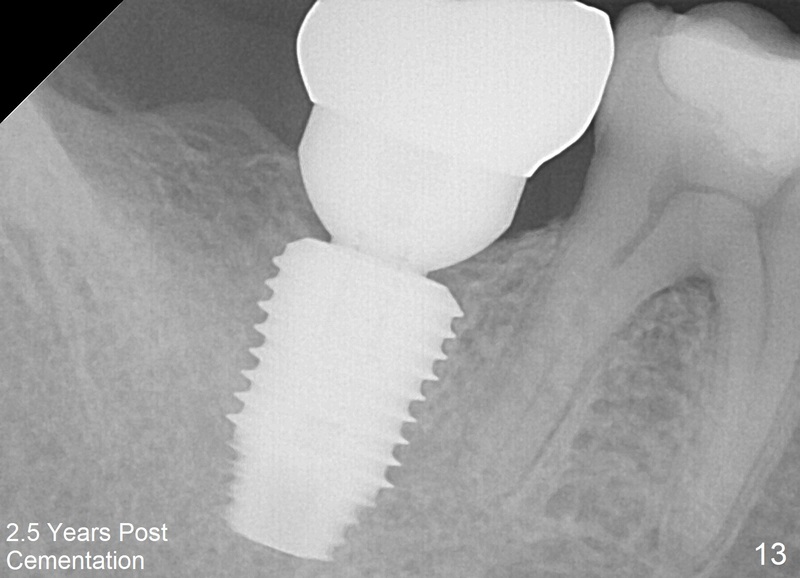 Dense bone appears to have grown into the implant threads nearly 14 months post cementation (Fig.11 <). The bone remains covering the plateau of the implant (arrowheads) 22 months post cementation (Fig.12). The bone remains stable 2.5 years post cementation (Fig.13).